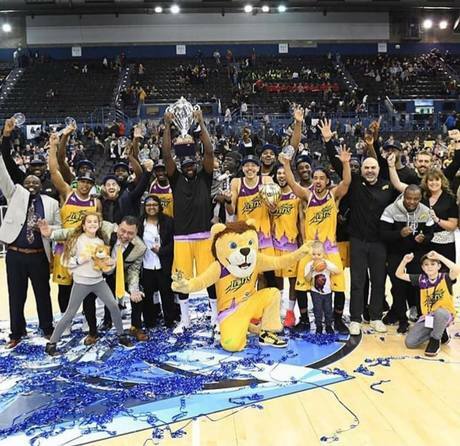 London Lions won the BBL Cup when they beat the Glasgow Rocks with a 68-54 win in the final over the weekend in Birmingham. The win was a brilliant achievement for the Lions, who are now the leaders of the BBL championship. Brandon Peel top scored for the Lions with 21 points to win the Most Valuable Player award. "This is arguably the greatest moment of my career so far as a Lion," he said. "I didn't come from a very winning background, so this means everything to me right now." "It's very special for the club and all the individuals on the team," said Vince Macaulay, Lions head coach. "Yes, we're winning a title now with the guys you see in yellow, but you've got to remember the people who helped us get here along the way." Copper Box Arena and the GLL Sports Foundation are delighted with their success, as the Foundation has supported the team since August 2013. The London Lions were born playing out of Crystal Palace National Sports Centre, before they moved on to CBA. Since then the Lions squad have gone from strength to strength, with a many exciting and memorable games at the venue which they have made the home of London basketball. In the tradition of Olympic legacy, GLL and the club has forged a very successful partnership, creating London’s only professional basketball team whilst building a strong community based club. The club run a number of school programmes and regularly hold open coaching clinics, where boys and girls between 8 – 18 years can learn basketball skills from some of the best professionals in the UK. The GLL Sports Foundation have played an important role in the team’s success, with support in various ways including gym memberships, courts for training and financial assistance. GSF currently support 83 basketball athletes across the UK. The London Lions return to their home ground to take on the Cheshire Phoenix in the quarter final of the BBL Trophy this Saturday 2nd of February. Tickets are available here. Please see the fixtures below for the remaining season – we hope you can come and support the London Lions at the Copper Box Arena for what promises to be an exciting season!